I think we’ve probably established that the thing I hate most about cooking (aside from cleanup) is meal planning. I’m tired of being creative, tired of making decisions on everyone’s behalf. So at a friend’s suggestion, I signed up with a new meal program that she had been using: Hello Fresh. 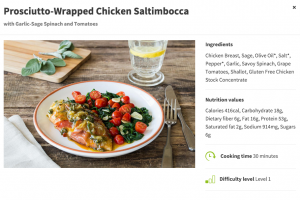 I’m sure you’re familiar with the meal delivery service idea by now, but as a quick review: You select meals in advance and the ingredients and recipes for three portion-controlled meals appear on your doorstep. 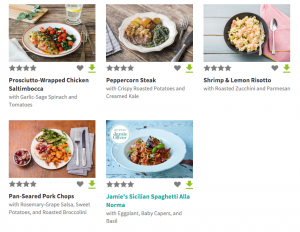 In the past I’ve done Blue Apron and Gobble, so I’ll review Hello Fresh in comparison to them. In each category, I’ll award points: 3 for best, 1 for worst. We order the meals for two. There is generally enough to stretch to accommodate all three of us, though sometimes I’ll extend a bit. On chili night I added an extra can of beans. Tonight I’m making rice to accompany the chicken saltimbocca. Minimal cost and effort. When comparing prices, note that you’re clearly paying more for convenience. The more work they do, the more you pay. * I’d like to give Gobble an extra bonus point for giving me no hassle whatsoever when I canceled service after the fire. They were the single fastest, most responsive vendor we dealt with of any kind. I think the whole process took two minutes by phone. If you want to try Hello Fresh, you can use my coupon code [SMW55P] for $40 off your first order.